2nd Regiment, New York National Guard. Officers, circa 1910. A trio of New York National Guard officers. Their names are on the back, but I can only make out 1st Lieut. George Armstrong, and (maybe) 2nd Lieut. Ed Van Etten. The photograph on the wall behind them is captioned, in part, "Officers. 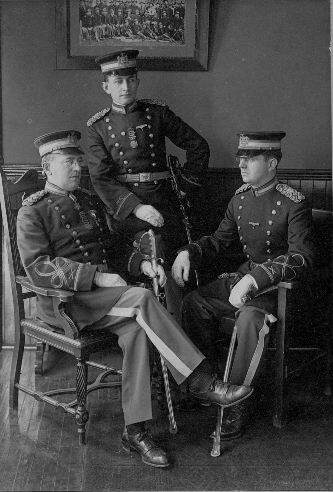 2nd NY..." and appears to be from the time of the Spanish-American War, perhaps ten years before the time these three officers sat for their own photograph. Click here for a large view of the entire photo, and on the individual details below for further closeups (left to right as on the main photo).